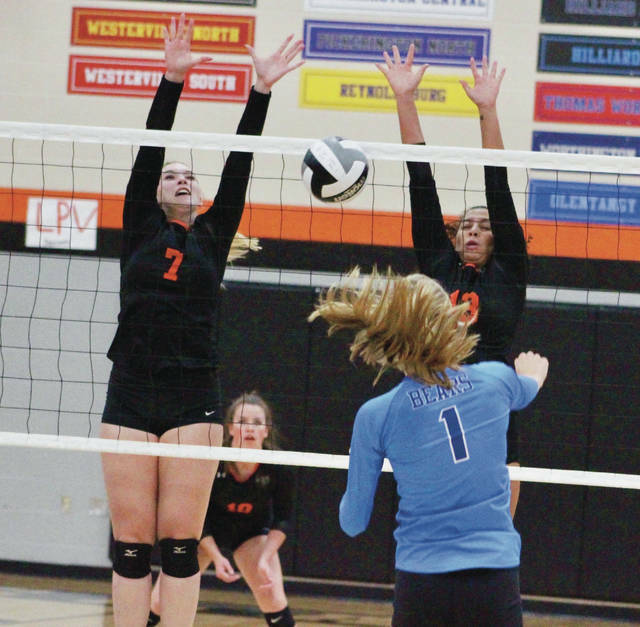 Hayes’ Kaiden Murphy (7) and Isis Price combine for a block during the first set of Thursday’s OCC finale against visiting Berlin. The principal of a self-fulfilling prophecy is a belief that something comes true because one believes it’s already true. Senior Isis Price believed the simple action of being energetic – even if it’s not true energy – would eventually become the real thing. So, when the Pacers were down four points in the third set – their largest deficit of the game – Price brought the energy. Hayes reeled off three points. More energy, more points. And the self-fulfilling prophecy took form in a 6-0 rally to put the finishing touches on a 25-17, 25-16, 25-19 Pacer victory over visiting Olentangy Berlin to wrap up OCC-Cardinal action and the regular season. Hayes needed the positive mindset after losing its previous two games. The energy wasn’t quite there, Martin said. Sydney Krewson had nine kills and Price and Becca Rocassin added six apiece for Hayes. The Pacers used a 6-0 run to gain control and scored eight of nine later in the first set to put it out of reach. It took a little longer in the second set, but a 7-0 run got the Pacers to match point before Kaiden Murphy’s kill sealed it. The Pacers (14-8, 8-6) served up 10 aces led by McKayla Gill, Maisy Johnson and Anna Johnson with three apiece. Anna Johnson also led with 14 assists and 11 digs. Berlin got a solid effort out of Heather Higgins, who tied Ella Showalter with four kills. Higgins also led with three aces and added 10 digs, just behind team-leader Shelby Buck, who had 12. Morgan Lenix had eight assists to lead the Bears (5-17, 1-13) as well. Berlin started 2-0 in the first set, but didn’t have the lead again until early in the third. The Bears led by as much as four on three occasions, including as late as 12-8 before the Pacers’ game-clinching rally. One would think that Berlin wants a clean slate as it embarks on its first offseason. But, that’s not the case at all. The Bears play the winner of the Heath-Licking Valley matchup. Berlin is the 13-seed, Heath is eighth and Licking Valley is 11th, so the Bears will travel to the winner Wednesday night at 6 p.m.
Hayes is the 15 seed in Division I and will host 28th-seeded Thomas Worthington Tuesday night at 6 p.m. in a matchup of OCC-Cardinal foes.